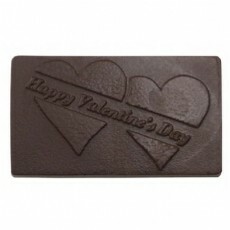 Solid chocolate, foil wrapped with imprinted label applied to foil. Choose from milk, dark, dark mint, and white vanilla. This piece is also offered in a gift box either bare or foiled for an additional charge (see item#BSC11100). Production: 10 days Includes up to 4 color process imprint.